CC-6201, Ideal for sealing dry powder, solid goods, hardware kits, stationery, electronic parts, toys, bread and medical instruments…etc. Bag length ranges from 4 to 20cm. CC-6202/6205, Ideal for sealing liquid, glue, powder, hardware kits, fully packed products and oily products…etc. Bag length range from 12 to 30cm. 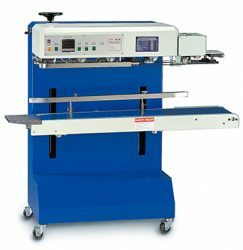 CC-6204, Features two Light Duty Horizontal Sealing Machine in one.It provides high production capacity, high efficiency, and space saving. 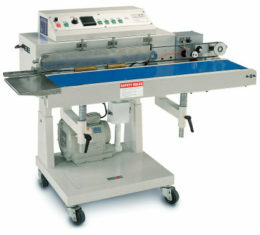 CC-6207, Features close to Light Duty Vertical Sealing Machine. Seals bag height range 500-1000 mm. CC-7201, Ideal for sealing extra heavy bags for product weight over 15kgs such as machine, hardware, food, canvas, chemical…etc. CC-7202/7203, Ideal for sealing dry powder, solid goods, hardware kits,stationery,electronic parts, and medical instruments. Bag length range 4-30cm. 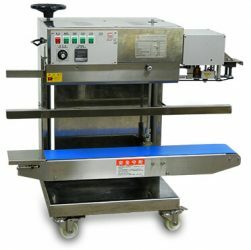 CC-7204, Constructed with front and rear conveyor table, allowing two operators to seal simultaneously. 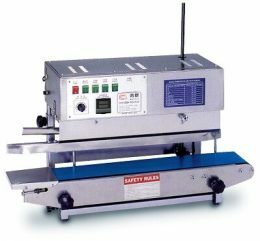 Features two Medium Duty Horizontal Sealing Machine in one. CC-7206, Ideal for sealing liguid, powder, glue hardware kits and oily products. Bag length range from 10 to 40cm. CC-7207, Vertical sealing principle especially suited to seal content such as hardware kits, liquid, powder, glue and oily products …etc. CC-7209, Mounted with an exclusive suction device for fully sucking air out of the bag before sealing. Virtually extends expire date, reduces package volume and saves storage space. 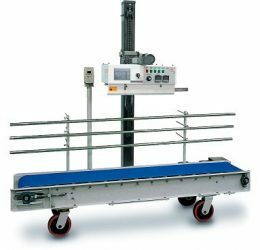 CC-7212, A sealing machine fitted with the conveyor for efficient operations. Ideal for mass production line.